It is an unfortunate reality, but sometimes animals die on your property or even in your home. We see it many times a year and it creates a real problem for homeowners. While it isn’t one of our favorite calls to handle, dead animal removal is one of our most appreciated pest control services! Not sure if an animal may have died in your home? Dead animal removal services can be critical when it comes to your home. Shortly after an animal dies the decomposition process begins. The body’s own chemicals and enzymes will begin to break down its tissue, which is then followed by bacteria and even scavengers, such as insects and other animals. This process produces the gases that are released causing the strong odors we smell when near a dead animal. Depending on the weather, an animal may die and go unnoticed for a period of time before you begin to smell an odor. This difference in time versus noises that were previously heard (if heard at all) often leaves homeowners confused as to what the source of the odor may be. The odor may even come and go at times making it difficult to locate the source. Regardless of when the animal died, the odors associated with it don’t always go away without removing the carcass as moisture may cause the odor to return even after a very advanced stage of decomposition is reached. The primary concern for most people is the odor, but there are a few other things to be conscious of when dealing with a dead animal. Most wildlife is susceptible to external parasites and we often encounter fleas and ticks on the animals we deal with. Depending on the species of animal that has died, you could run across several other parasites — both internal and external — in addition to zoonotic diseases that could potentially pose a threat to your health. Dead animal removal is best left to the pest and wildlife control experts. The best course of action is to simply avoid close contact with a dead animal unless wearing proper protective gear. 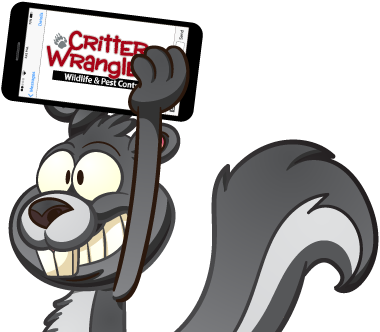 Critter Wranglers will find the source of the offending odor and safely remove it. After the animal is removed, we will use a variety of products to clean up the mess left behind, disinfect the area to help with the odor, while also killing bacteria that may be present. Because we are also a licensed pest control company (most wildlife services are not), we will also be able to treat the area for any fleas, ticks, mites, maggots, beetles, or other insects that may be present due to the carcass. Beyond all of that, if an animal made its way into your home, we will inspect the area to find out how it entered your home. Then, we can give you a quote for animal proofing, or, if you would prefer, we can consult you on performing the work yourself. Dead Animal Removal – How much will it cost? These removal calls may be as simple as picking up a dead animal from your yard and spraying a disinfectant, or as complicated as disassembling ductwork, moving large amounts of materials, or cutting holes in walls to get to the source of the problem. Given the varying amount of time, size of animal removed (deer will cost more), specialty tools and expertise involved we are unable to quote this without speaking to you to learn the specifics of your problem. If you suspect an animal has died in your home, business, or on your property, call Critter Wranglers for safe dead animal removal. Don’t try to do it yourself when our pest and wildlife control team has the proper equipment and materials to get the job done for you. Need other pest control services? Learn more about our pest control, animal trapping, and auxiliary services!